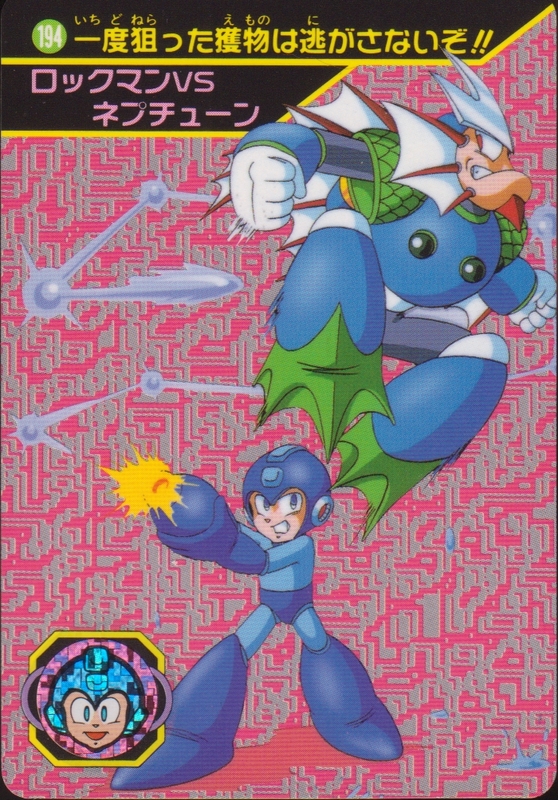 Jumping around with the Carddas again, today’s card is from the 5th series of classic Rockman cards, portraying Rockman’s battle with the Space Ruler (or Stardroid) Neptune. This card is unique because it depicts Rockman using the Spark Chaser special weapon. So far as I’m aware, this is the only published picture showing what color Rockman turns when he’s equipped with it–and actually, it turns out to be no color difference at all. Too bad! 194. Take one aim at your target, and there will be no escape!! 4 Comments to "Free Chaser Friday"
… I don’t think I like you anymore. Thanks for showing this. Neptune is going to get zapped now.